If you are using power over ethernet or using a small 5V regulator to power your Raspberry Pi from a 12V battery – e.g. if you are planning to solar power your Raspberry Pi, then you may not want to go to the trouble of fitting a micro-USB connector to the end of your power in cables. In this case it is possible to simply solder a couple of wires to the base of the Raspberry Pi to feed in the required 5VDC. 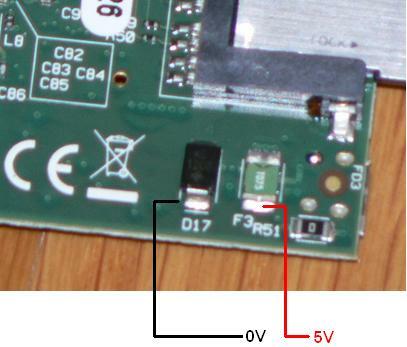 The image above shows the way this should be achieved – the red wire for the positive 5V input, and the black wire for the negative/ground input. The positive wire connects to the reverse polarity protection diode, and the negative wire to the fuse, both of which remain fully functional with this wiring method. The wires used should be good quality multi-stranded cable rated to carry at least 1 Amp. 7/0.2mm (7 strands of 0.2mm) cable is the minimum requirement. Check the insulation along the length of the cable very carefully to ensure that there are no holes in it which could lead to short circuits on the underside of the board. If your Raspberry Pi is in a case, then you just need to drill a small hole through the side of the case to enable the two wires to be fed out ready for direct connection to your 5V regulator or other 5V power source.